Reluctantly for sale - This Stunning Property, built in 2008 is located 100m from the beach and Promenade in Sao Martinho do Porto with a shared courtyard and pool. Park Residence is the perfect place for those who want to appreciate the pleasure of holidaying or living in a traditional Portuguese fishing village. Built in traditional Portuguese style, the apartment is fitted with modern, high quality fixtures and fittings, seamlessly blending the classic with the contemporary. 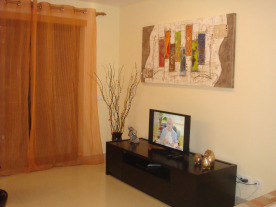 This one bedroom apartment has an attractive kitchen/living area and bathroom. It is located in a perfect position 100m from the stunning shell-shaped beach which is an excellent and safe swimming environment for children. 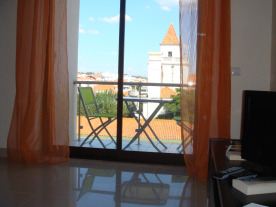 A few minutes walk to local restaurants, bars, shops and a traditional Portuguese market and supermarket. 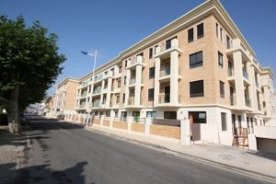 The apartment is situated on the 3rd floor and comes with it's own underground parking space and has lift access; it has air conditioning/heating, a high specification, as well as a secure underground car parking space. If you would like to view the apartment between Tuesday 7 May to Saturday 11 May 2019; please get in touch and I will be delighted to show you around. For two centuries, the preferred holiday destination of the Portuguese Royal Family, this village resort has retained its quality and exclusivity whilst gaining in popularity. São Martinho do Porto, on the Silver Coast (Costa de Prata) of Portugal, sits 56 miles north of Lisbon, the capital city and 120 miles south of Oporto, the second city. Lisbon International airport is less than an hour’s drive on the A8 motorway and is, in turn, less than two hours ’flight from the UK. Interestingly, Madrid is closer to the Silver Coast than to the nearest Spanish resort. This will become effectively closer still with the completion of the TGV (high speed train) route from Madrid to Lisbon and a scheduled stop at Leiria (close to São Martinho) just 2½ hours from Madrid. From London, Lisbon is served direct by TAP Portugal, Monarch, BMI Baby, BA, EasyJet, Air Berlin, XL Airways and Avro. There are others from Birmingham and Manchester including ThomsonFly. Prices are generally very competitive as a result. as the local market which trades every day except Mondays. motorway, and the neighbouring village – only 5 minutes away – has a lovely horse-riding school. Three established golf courses are within a 20-minute drive – Praia Del Rey, Bom Sucesso and Campo Real – and a further five courses are currently in the design and approval stages. The first is in São Martinho itself and one of the others just 10 minutes away. thermal springs is just 7 kilometres distant. Comprising a total of 70 apartments varying in size from a Studio of 52 m² to a large 3-bedroom apartment of 140m², this development has been carefully designed to a very high specification. Due to very restrictive planning rules (a good thing) there are unlikely to be any further beach-front schemes, which means that prices will increase over time. There are a distinct lack of properties available as close to the beach as our Park Residence development! You can literally walk to the beach in approx two to three minutes.